The bath tub on the occupy site has a drum trap. 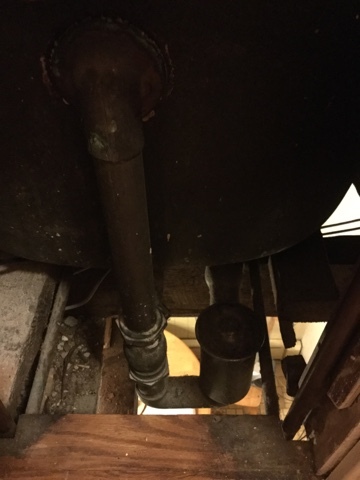 For those of you live in newer homes (or don't do your own plumbing), a drum trap is like a small holding chamber for larger items in waste water which was used for largely before P- and S-traps were more uniformly adopted. I also think they were used as a main clean out for all bathroom fixtures and were often accessible in the floor of the bathroom. Drum trap as viewed from access panel behind tub. Yes, that is my kitchen below. The trap is simply a small cylinder with a screw-off lid. It is about the size of a can of beans. Owners of drum traps know that they need to be serviced every so often. Which means, they need to be opened up and manually cleaned out. It's a gross and smelly job, and it's also why they have fallen out of favor compared to the other trap options. Anyway, I had to get in there for my bi-annual cleaning. Especially since the tub is now draining slow as mollasses, if not slower. It's terrible. Sadly, I was in there maybe three months ago and cleaned it out and the end result was little-to-no improvement. As a last resort before I disassemble the tub overflow, shoe and trip lever assembly, I figure I would get my hands dirty for yet another clean out. Maybe try to auger out I each direction, pre- and post- drum trap. Well how about that? Inside a pretty satisfying-sized pile of greasy, grimey goop, tear was a piece of my trip lever! I was unaware that part of the linkage has fell dow the drain. The linkage was catching everything trying to pass through the lead line. The drain works much better after a test shower. 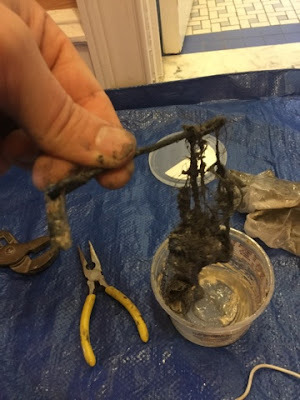 You definitely need a shower after pulling schmutz out of a drain. I am not going to lie: it is vile. I still want to check for drain pitch. I have a feeling this house was never plumbed right to begin with.